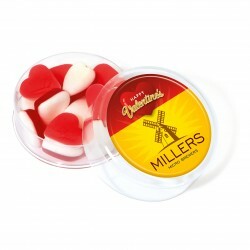 Printed wedding favour sweets are a small but vital addition to the guest tables at your wedding. Filled with a variety of sweet treats, and thoughtfully customised with the details of the special day, they create a lasting enjoyment of the wedding for all. Printed organza bags add to the glitz and set up the table for success from the first moment. 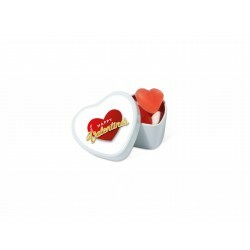 Wedding favours also come in a variety of other styles - from printed sweet tins, to individual love heart rolls - making sure love is in the air throughout the event. They can be used as table setters, or as part of your own personalised wedding gift bag. Children love edible table decorations, and our branded wedding favours ensure they’ll keep on their best behaviour while the celebrations are going on in style. Weddings are the perfect occasion to enjoy a taste of luxury - from the venue down to the smallest details. That’s why investing a little more in favours for your guests makes sense for every wedding. Sweets for wedding receptions are not only a great choice for the day of the nuptials but also work well as a reminder of bridal showers, stag parties, hen parties, and more. This personalised gift will delight the youngest of guests and onward without a doubt. Your guests can take home one of your mouth-watering sweets to commemorate that fun and exciting day. 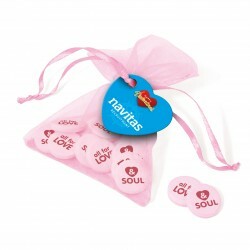 Whether its wedding favours or rock sweets or our uniquely designed lollipops, we can help make a significant impact on the day of your union. Put them into wedding favour bags or just decorate the tables with our any of our branded sweets selection and watch as your family and friends enjoy your tasty thank you present. Creating your own custom printed sweets with Printkick is a breeze. We offer a vast range of tasty sweets that you can design with your artwork, so you can be ready to give out a beautiful item on your wedding day to your guests. We offer a full array of colours and flavours for you to pick from for ultimate customization and to make sure your design suits your wedding theme. 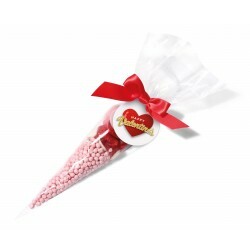 From cone bags to wedding favour sweet jars, whether you want heart shaped wedding sweet boxes or even something more simple like flow pack sweets, we have the lot! Each personalized wedding favour can be used creatively to enhance the look of your party. Here are our top 5 suggestions on using our wedding favour sweets. These trends are sure to be a hit and look stunning at your next event. Draw attention to a centrepiece or to a small bouquet, by placing a few heart shaped chocolate lollies between the flowers to add a playful touch to your flower arrangements. Another great way to get the most out of a bag or tin of sweets is to have them as table placeholders for each guest to find their seat. A top wedding trend this year are candy buffets! Place whimsical organza bags around your dessert display to decorate the table and give it a delicate touch. You can also take it a step further and create an elaborate candy display tower! Lastly, our wedding cone bags are an interactive way for your guest to taste a throwback at a retro themed wedding. The perfect wedding favour to suit your needs has never been easier to pick out. We want to make sure your stay focused on your big day, not on stressful planning. With low order minimums, ordering wrapped sweets for wedding favours in bulk can be as little as 100 items, making ordering totally accessible even for smaller receptions or events. Don't worry, at Printkick we won’t hike up the price for smaller orders. 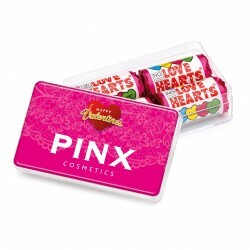 In fact, you can get an instant quote on your personalised wedding sweets. With over 30 years of experience in promotional and personalized products and gold rating of 4.8/5 on Feefo, you can be sure you can trust Printkick help you plan your such an important day. We have a number of tools to help you get all of your shopping done at one place. We offer instant pricing and free mockups so you have complete control of your budget and final product. Once you have finalized your order, all you have to do is sit back, relax and wait for your customized wedding favour sweets to come to your doorstep. As most of our standard products can be screen printed in just one to five working days, you don’t have to wait for weeks for your order to arrive. You can immediately track it online upon purchase, and we will even send you an automatic message update when it is out to be delivered. Our customer support is all dedicated to making sure that you are delighted with your bespoke freebies for your wedding day. If you have any questions about your order or what other products we carry, just pick up the phone, send an email or chat with us live anytime.